I would really like to use this skill but cannot find it on the skill store (UK). Any chance of a link (etc) please? What happens when you say “Alexa, enable the My Notebook” skill? I thought I set it up for all countries. Andy: It just got enabled in the UK store too … let me know if you see it now. Does it enable in other countries automatically? I’m in Canada and not finding it. Nice work Damian — I’m curious about your inclusion of Onenote though…..
John, great to hear from you! Its just the reality that many people use OneNote. I’m still a hard-core Evernote user, although I use OneNote at a customer I’m currently consulting with – I still prefer Evernote, primarily because of the hierarchical tagging. At the moment I’m just seeing what the reception is to the skill before deciding where to take it. The permissions I request from Evernote only give the skill the right to create notes on your behalf, not update them. That said, if I see the demand, I’ll definitely revisit this. 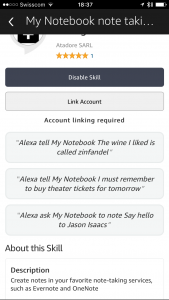 If you’ve not done so already I’d really appreciate a review of the skill in the Alexa app. I’m so happy that someone recognised the wittertainment easter-egg!!! Enjoyed using this – though I found that longer notes sometimes produced bizarre results, including more mentions of Jason Isaacs. Is Alexa stalking him or something? This is an issue with many skills, but a few tips and FAQs would be helpful. For example, is it possible to set up Evernote so that all Alexa’s notes go in their own notebook? Mine are ending up in the general one. Are some kinds of notes likely to work better than others? I notice that Amazon say Alexa is not good with numbers. Nice idea, though – I’ve done a review. Wow, it worked with one note on first try. Thanks so much. Only thing is that I don’t see a way to select a specific or default notebook. I have 4 and it is going into one one I use the least. I’m getting closer to finding the answer. It turns out there are two areas. Also just learned that by default, Onenote’s Quick Notes are not synced to the cloud. Info below shows how to do this – and setup some defaults. Update – got it working finally, but ended up cheating. None of the previously mentioned settings worked even after an overnight wait. Further reading identified that the default folder being used is actually the Quick-notes folder in the sample Onenote notebook named “Personal” everyone initially gets on their Ondrive. Seems others have struggled with the same issue, in that attempts to switch the default notebook isn’t working. Anyways, what I ended up doing was to moving around a bunch of sections and section groups from one notebook to another and then renaming notebooks as needed. So now, the original sample notebook has been renamed to my preferred name, and your Alexa skill is working perfectly. Might be a better way, but this worked. I would also like to know how to send to a specific notebook. Right now it sends to my Novel’s notebook and that is really confusing. Any chance you could enable this for the German skill store as well? But although you can say “Alexa, what’s my commute” out of the box, to use the specific National Rail Skill you have to say “Alexa, ask National Rail to check my commute”. Can I help with the Translation, to get into the German Store? Damian, can you please enable/add this for Alexa/Amazon/Echo India region as well? 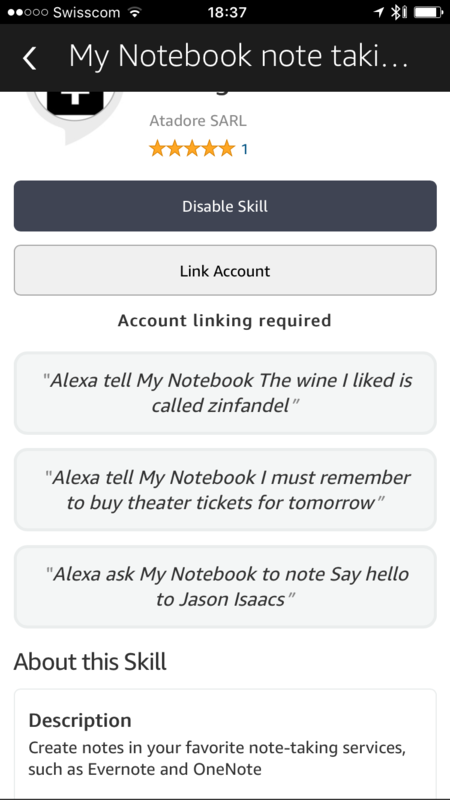 When I ask Alexa to enable the my notebook skill, she does not have a clue. Echo/Alexa devices in India were launched just 5 days, could you please add this skill to Echo/Amzn India as well? How do I make this skill insert the new page into the Notebook I want (or even the default Notebook)? It is inserting it into a Notebook I do not use. I gather from other comments that this My Notebook skill places notes I dictate into certain notetaking applications like OneNote or Evernote. What I can’t figure out is whether I can get Alexa to read them back to me, and if so, can she do so selectively? For instance, if I only want to hear notes containing the word “purse” or “phone” or “keys” — I think this would be very helpful to people like myself who are constantly misplacing items around the house. I would love to be able to say “Alexa, tell MyNotebook that I put my purse in the hall closet”, and then later be able to ask “Alexa, read notes about my purse”. Does this already exist, or is it possible? Thank you so very much! Working fine in Canada.